As the quarterback of America's Team, Dak Prescott is faced with a level of criticism each week that few athletes have to deal with. He is constantly questioned for his play, and even when things are going well, Prescott must answer his critics. But one area absolutely no one can question Prescott is his leadership, both on and off the field. Dak Prescott is the perfect role model for children and adults alike. He is constantly doing fantastic work in his communities and making sure he uses his platform for good to his best ability. 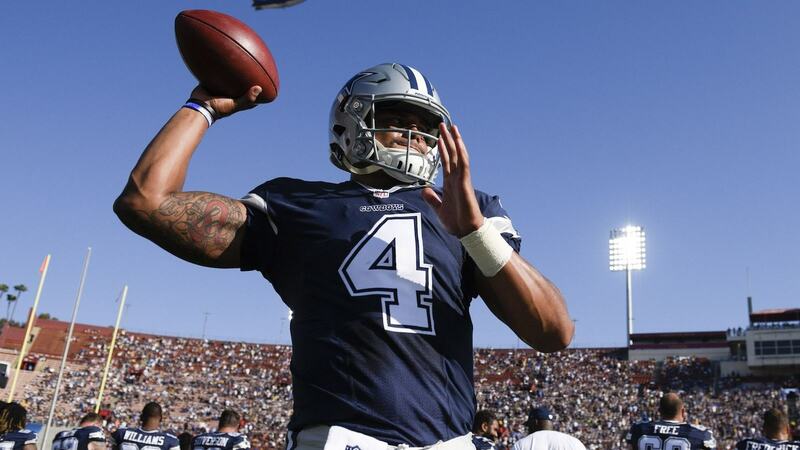 This week it was announced Dak Prescott was nominated for the Walter Payton Man of the Year award, and will be the Cowboys' candidate in the race. Of course, Prescott is well-worthy of the honor, and I wouldn't be surprised if he ends up being both a finalist and the recipient of the award this year. As mentioned by Mike Fisher in the above tweet, three Cowboys have won the award previously; Roger Staubach, Troy Aikman, and Jason Witten. Each of which is deserving, as is Prescott. Considering the award is given out for "commitment to philanthropy and community impact," I can't think of many more worthy players around the league than quarterback Dak Prescott. We can see this impact in the locker room and on the field as well, as Prescott was voted a captain in just his sophomore season. The Cowboys clearly respect Prescott, despite some of the flaws in his game, and seem to play hard beside him every week. Congratulations to Dak Prescott on this nomination.